Etosha National Park in Namibia had an incredible concentration of wildlife. We camped here three nights, and had one amazing wildlife encounter after another. This park is enclosed by a huge electric fence, and the animals congregate around the waterholes, making them easy to spot and observe their behavior. Many animals share the waterhole at the same time – often making uneasy eyes at the others as they all try to drink. 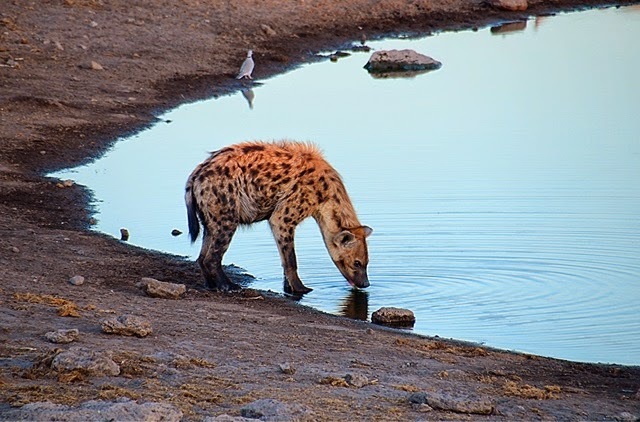 The waterhole was like the Switzerland of bush … a cautious truce is the unspoken rule as hyenas and jackals drank within meters of antelope and zebra. The truce even seems to hold true for the lions … we saw two male lions lounging back from the waterhole while their prey drank nearby. If the females had been there, it may have been a different story. At one waterhole we saw seven different species drinking at the same time. The young animals have much less fear than the adults, and they interact and play with young animals from other species. We watched a baby zebra running around kicking up its heels … bucking in circles and trying to torment the grown up zebras. When none of his own kind wanted to play, it ran up to a baby kudu, and started chasing it, and the two of them tore around in animal play scattering the impala in a game of interspecies tag. Many animals are extremely vulnerable to attack while drinking – especially the giraffe which is very slow to approach the water and usually posts a lookout to keep an eye out. 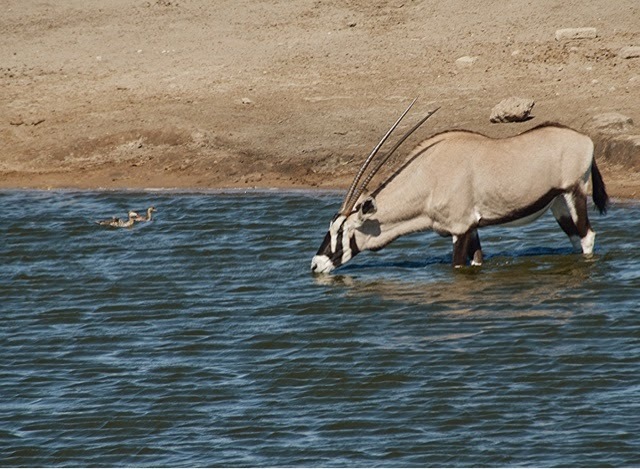 The oryx must either wade into the water or drop to their knees at the edge to get their heads low enough to reach the water. They are also easily attacked while drinking, and are very cautious and slow when approaching the waterhole. 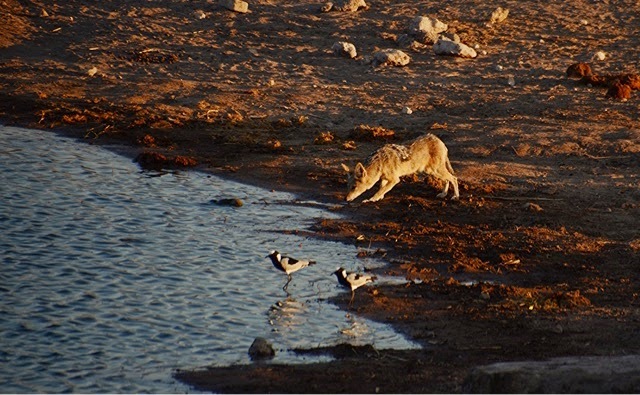 The jackal is a furtive, sneaky little animal – much like our coyote. They are timid, and we watched them prowl around the lion’s kill waiting for the lion’s to finish eating, hoping to get a bite. They prowled around our camp the same way, coming extremely close but too tentive to actually try and take food from us as we ate. Thank goodness. The lonely male impala wanders in by himself. He looked a bit nervous being out there all alone and very exposed. Animals come at night, too. 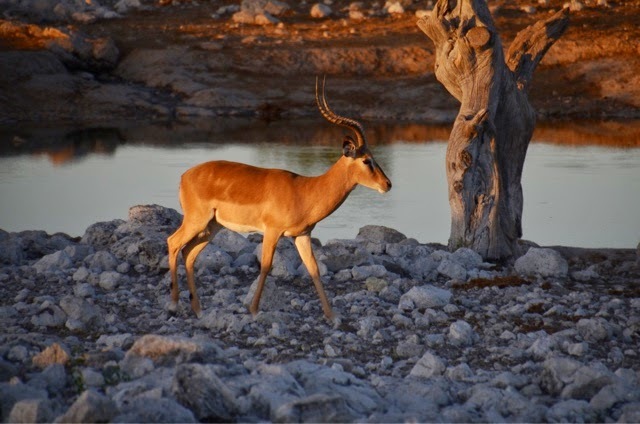 The campgrounds in Etosha are located by waterholes, and will light up the waterhole for a couple of hours at night. 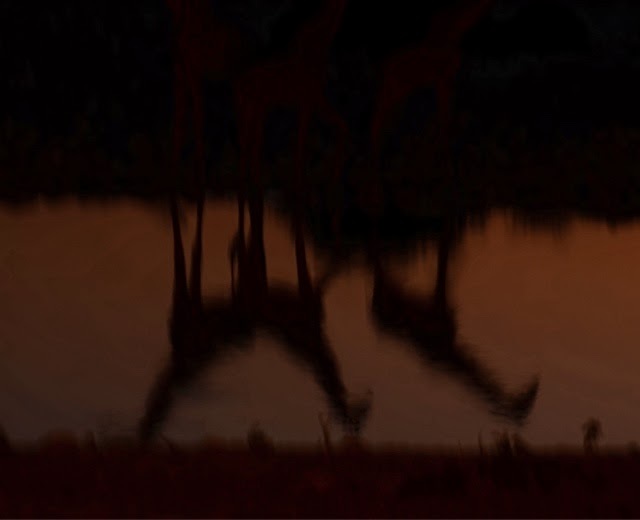 This photo is of the reflection of three giraffes in the water just after sunset.